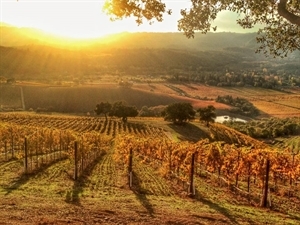 Sonoma Valley, in California's famous wine country, is the perfect place to retire. With 17 miles of rolling hills, vineyards, quaint shops, spas and countless parks, Sonoma Valley offers an escape from the hustle and bustle of life. Touted as one of the "friendliest" cities in America by Conde Nast Traveler, mix and mingle with the locals and visitors as you exchange pleasantries in the friendly town. Get outdoors to one of Sonoma Valley’s 13,000 acres of state and regional parks where you can hike, bike, run and experience the serene beauty of wine country. Take a park tour on foot or horseback and view ancient redwoods, historical buildings once the home of Jack London, reservoirs and hiking trails through the vineyards and mountainsides. Stop at a deli and pack a picnic with your favorite cheeses, charcuterie and of course, Sonoma Valley wine, and find your perfect picnic spot to relax and just enjoy your day. Escape from the hustle and bustle of daily life and enjoy the solace of wine country. Arts in Sonoma Valley flourish, from museums and galleries, to live music concerts, theatre performances and more. Sonoma County Transit offers busses around Sonoma Valley, and to the nearby city of Santa Rosa. Sonoma Valley Hospital and Sonoma Valley Community Health Center offer medical facilities to locals. Jan 37.3 F° 47.9 F° 58.4 F° 6.5 "
Feb 39.9 F° 51.8 F° 63.6 F° 6.1 "
Mar 41.4 F° 54.2 F° 67.0 F° 4.6 "
Apr 43.0 F° 57.5 F° 72.1 F° 1.6 "
May 46.4 F° 62.3 F° 78.2 F° 0.8 "
Jun 50.3 F° 67.9 F° 85.5 F° 0.2 "
Jul 51.9 F° 70.8 F° 89.8 F° 0.1 "
Aug 51.8 F° 70.6 F° 89.4 F° 0.1 "
Sep 50.3 F° 68.7 F° 87.1 F° 0.3 "
Oct 46.3 F° 63.2 F° 80.1 F° 1.7 "
Nov 40.7 F° 53.6 F° 66.5 F° 4.2 "
Dec 36.5 F° 47.5 F° 58.6 F° 4.5 "
Spring temperatures are cool with averages in the upper 50's and highs in the low 70's. Nights are cold with lows in the low 40's. Summer temperatures are mild with averages in the upper 60's and highs in the upper 80's. Nights are cool with lows in the low 50's. Fall temperatures are cool with averages in the low 60's and highs in the upper 70's. Nights are cold with lows in the mid 40's. Winter temperatures are cold with averages in the upper 40's and highs in the low 60's. Nights are cold with lows in the upper 30's. Volunteer for countless nonprofits in Sonoma to stay busy! From Transcendence Theatre Company, the Sonoma Valley Visitors Bureau, Sonoma International Film Festival, Boys & Girls Clubs and more, there are plenty of events and organizations to donate your time to.